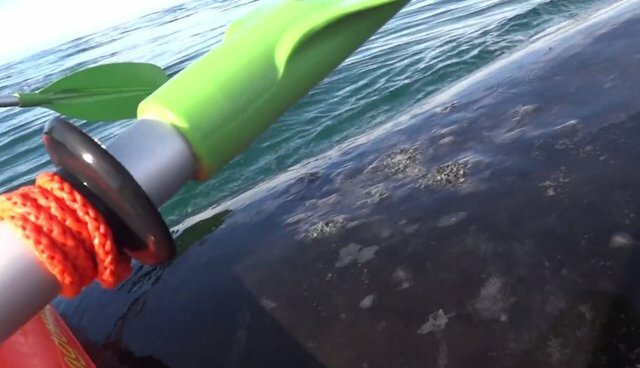 Two kayakers out enjoying a sunny day off the coast of Puerto Madryn, Argentina have captured some jaw-dropping footage of what is easily one of the most unbelievable whale encounters ever caught on film. This video shows the pair on a tandem kayak, drifting in to get a better look at two humpback whales some ways off. The kayakers seem to stop paddling in order to keep their distance, but then one of the massive animals move towards them, swimming beneath the boat before actually lifting it out of the water balanced on its back. For a few moments, the kayakers are stranded atop the whale until it dips back below the surface of the water, seemingly undisturbed by the encounter. "An incredible afternoon, lots of sun, kayaking and whales," writes YouTube user gisela6652. "As we watched from the top of the kayak, one of the whales turned and came our direction and lifted the boat two times!!" Since news of this unusual incident broke across local media, regional environmental officials have issued a reminder to other boaters that it is against the law to interfere with whales -- though judging from the pair's reaction in the video, it's probably fair to say they weren't expecting to get quite as close as they got.